Day 3 of our Patient Appreciation Challenge, plant something. Stop by the office for a gardening kit. Let's start the year by cultivating something new! Planting and caring for something can be a great way to shift your focus and become less stressed. Not to mention, its great for the environment! Looking forward to seeing all of your sunflowers grow! Gardening kits at the practice to pickup. Platinum Chiropractic, Santa Clara CA, Day 1 challenge. Each day you should get half your body weight in ounces of water. Monday is Day 1 of our January Health Challenge. Your task: Stay Hydrated. Sounds simple enough, but it is easy to go through the entire day and forget to drink water. You should get half your body weight in oz of water each day, and no coffee doesn’t count ;). That’s roughly 2-3 liters of pure water. Set an alarm on your phone to remind you of water breaks. Don't forget about the Patient Appreciation Month we have planned for you all to kick off 2018! Throughout January, stop into the office to pick up cool swag and enjoy free samples. Tuesday January 9th we will have our Second Tuesday workshop: Mobility Class with Dr. Karo. Time to Party! Tuesday February 6th at 6:30 pm come into the practice for some food, fun, and your chance to win the raffle items. Check out the Platinum Chiropractic Community Facebook group for more details. Last Tuesday we had our monthly seminar, which was on the topic 7 Ways to Bulletproof Your Immune System. The majority of the talk was about shifting our paradigm of what healthcare really is and what is most congruent to us as a human species. We discussed the concept of epigenetics and how your environment rather than your genes dictates your DNA and your health. Although it’s very hard to decide on the top ones, these seven actions are among the top for improving health naturally. As many of you know from personal experience, regular chiropractic care has very powerful natural and safe immune boosting qualities that have been documented with many health research studies, making it the most important item on our list. Dr. Karo will address the top 7 things you can do to improve your immunity, and fight the flu. 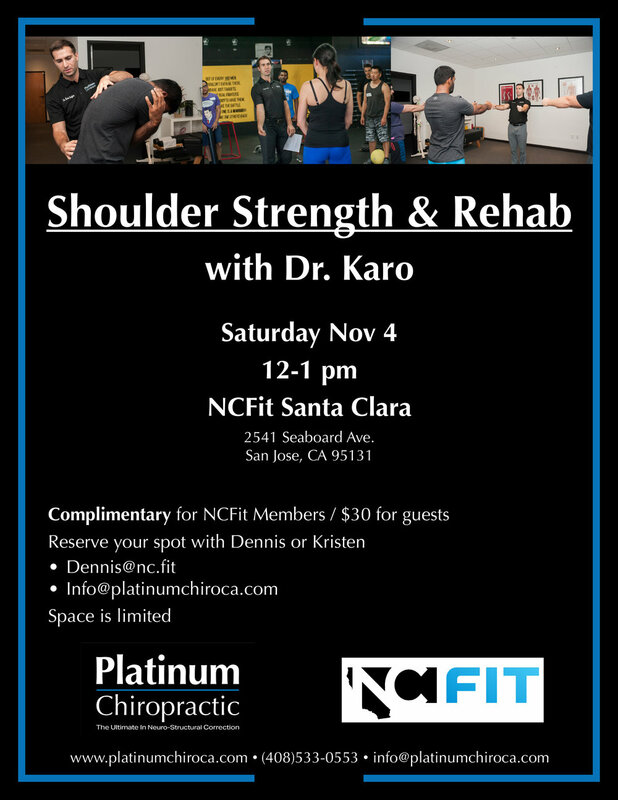 The workshop will be held at our practice location in Santa Clara on Stevens Creek Blvd. Reserve your spot today! December’s 2nd Tuesday Workshop will be about the immune system and strengthening your resistance during the flu season. Dr. Karo will address the top seven things you can do to improve your immunity, and the common mistakes people make that cost them their health. Come on in Tuesday December 12 at 6:30 pm ready to learn 7 Ways to Bulletproof your Immune System. RSVP to Kristen via the form below. Friends and family welcome, but space is limited so sign up now. Thank you for registering for December's 2nd Tuesday Workshop. Kristen will get back to you shorlty. Don't miss Platinum Chiropractic's special guest Arsy Vartanian this Tuesday night. This Tuesday we will have special guest Arsy Vartanian speaking about Hormone Disruptors for our 2nd Tuesday workshop. Arsy is the author of The Paleo Slow Cooker: Healthy, Gluten-Free Meals the Easy Way (found on amazon.com) and her blog Rubies & Radishes. She also works as a consultant for Beauty Counter and helps to raise awareness about the hidden evils in many of your household products. You can learn more about her here. Come learn about hormone disruptors, why it's important to choose safer skincare, and other potential health concerns associated with chemicals in your household products. Most importantly, become empowered to make safer choices. Arsy will also bring the full line of high performing, safer skincare and cosmetics from Beautycounter for you to sample! RSVP to Kristen at info@platinumchiroca.com. Guests are welcome.